There can be a wistful feeling when an exhibition comes down in the gallery. I really enjoyed our exhibition, Mosaics, last summer and frequently found myself learning something new as I wandered through it from time to time. I was sorry to see it come down. 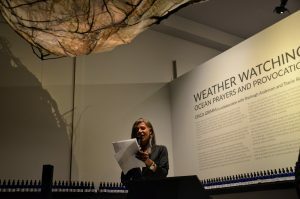 I felt that same sense of regret when it came time for our most recent exhibition, Weather Watching: Ocean Prayers and Provocations, leave our gallery. 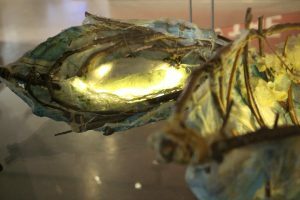 A collaboration with The Reach Gallery Museum in Abbotsford, we were privileged to host a satellite exhibit of the Salt Water, Skin Boats. 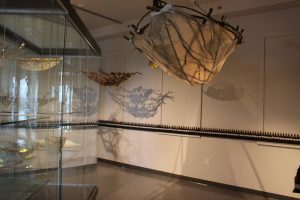 Art work in both exhibitions was created by Erica Grimm in collaboration with Tracie Stewart and Sheinagh Anderson. 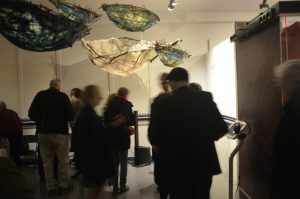 With coracles (from the Welsh cwrwgl: a small one person boat dating back thousands of years) suspended from the ceiling, casting intricate shadows on the walls, vials of water and fluids lining the walls, and an evocative soundscape playing throughout, the exhibition certainly drew attention and conversation. The coracles were traditionally made: branches woven and then covered with thin materials, both paper, Dacron and sheepskin. 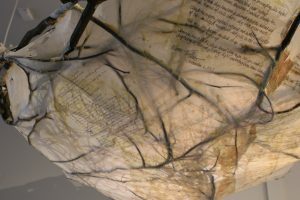 Poems were written on the materials, as odes to the oceans, interspersed with scientific equations. 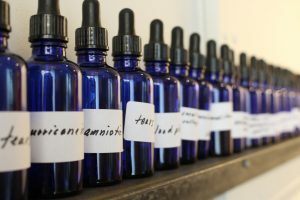 The artists intended to demonstrate the significant similarities between our human bodies and the global bodies of water, so it was entirely appropriate that this story be told on the shores of the Salish Sea. The show lent itself well for interactive engagement. Weekly yoga classes were hosted in the transformed space and were warmly received by those who attended. 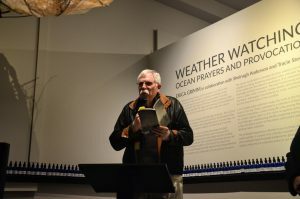 Weather Watching culminated at the reception held on March 9 when we were delighted to have almost a hundred people join us for poetry readings by Susan McCaslin, Ted Blodgett, and Renee Sarojini Saklikar, some of those whose work had been woven into the coracles. It was a vibrant evening right to the end when Celeste Snowber danced homage to the waters under the stars. And so, while we are grateful to have had the opportunity to share this exhibition, the time has come to tell a different story. 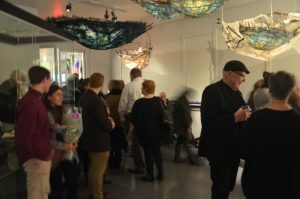 Our newest exhibition, Fathom, opened on March 24th. Bailey Snider and Emily Arnett, honours students from Trinity Western University’s Art and Design program, share their efforts to recognize and give form to inner worlds. I invite you to come and share with us the story told by these talented artists.